Knead to Cook – Page 121 – Food & fitness obsessed girl. Okay I have one child that lives to eat & one that eats to live! My youngest daughter doesn’t have a huge appetite ever! So, with that, I try to make every bite as vitamin packed & healthy as possible. 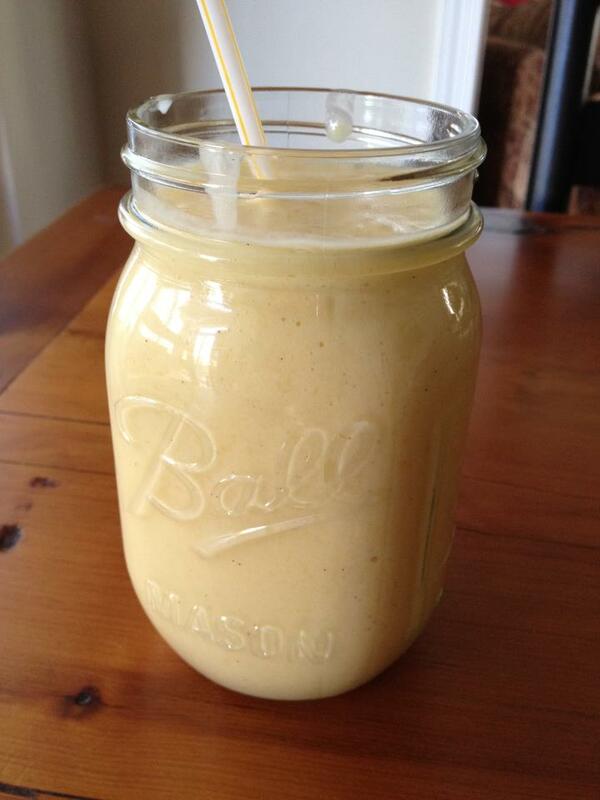 This smoothie is super healthy & delicious. I promise… the kids have no idea how good it is for them! 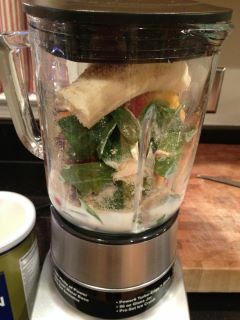 In a blender, add a handful of baby spinach leaves, two cups of fruit – frozen, fresh – whatever. 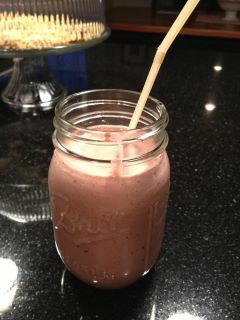 I added peaches/strawberries/cherries & 1 banana. I scoop of Whey protein powder. Optional – you can add a scoop or two of low fat frozen yogurt or ice cream (I normally do this but didn’t today) or a scoop of yogurt. I also add one cup of almond milk (you can use regular low fat milk) and 2 tsp of flax seed meal and then start to blend it. My blender has a smoothie setting so I use that. Once it starts to combine, I will drizzle more milk in to get the consistency that I wish to achieve. 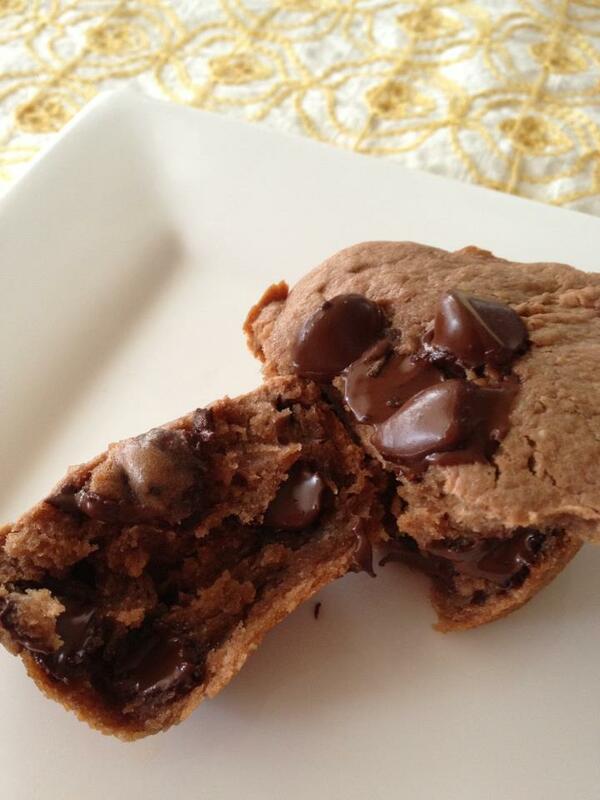 Pour into a glass, add a straw and enjoy! We don’t normally eat a lot of red meat in our home but when the cold weather rolls in, as it has, there is something about a pipping hot bowl of beef stew that just warms you up. 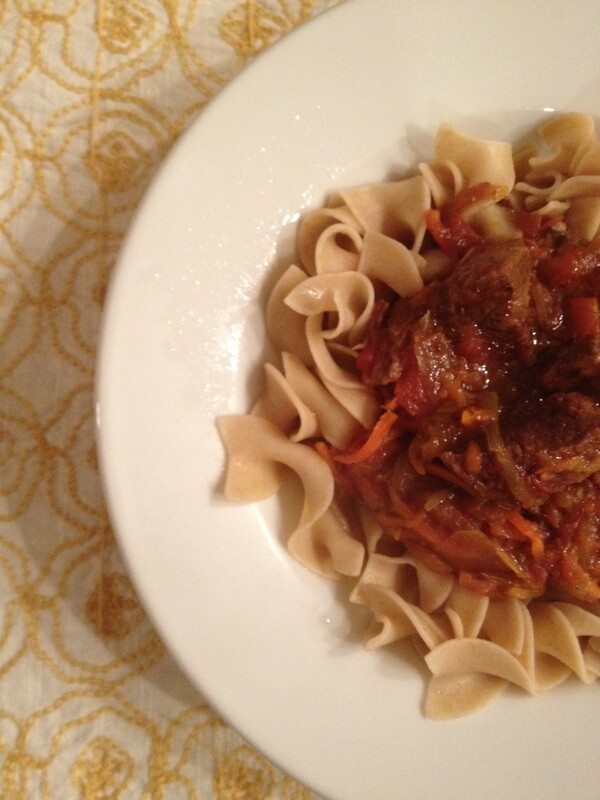 I served this stew over whole wheat egg noodles. The family loved it! Another benefit, it was made in the crock pot so dinner was remarkably easy. 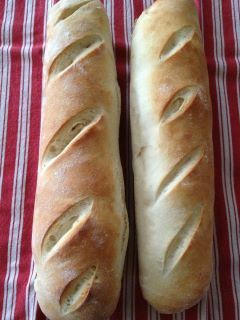 I served this with the crusty bread I made yesterday. Great pairing! In a skillet over medium flame, add the olive oil. Add the carrots, onion & celery & cook for 8-10 minutes, stirring often. Then remove and add to the crock pot. Add the cubed chuck roast along with tomatoes, broth, garlic, pepper flakes, salt & pepper. Cover and cook on low for 8 hours. If you have less time, cook on the high setting for 4-6 hours. Right before serving, cook the pasta according to the manufacturer’s directions. Drain and plate. Pour the beef stew over top and serve with a good crusty bread. This is the perfect soup for a cold winter day when you crave warmth. The aroma is intoxicating & the unique flavor will satisfy the carnivores in your family. Although this soup is not vegan, it is vegetarian. It can be adapted by opting not to simmer the soup with the Parmesan rind or adding the cheese. In your Dutch oven, heat the olive oil over a medium flame. Add the onion and cook until translucent, about 6 minutes. Add the garlic, cook for one minute. Then add the diced tomatoes and cook for 10 minutes. Add the broth, carrots & Parmesan rind and grated cheese. Cook this for about 30 minutes. Remove the rind carefully after that. I simmer this on the stove all afternoon, covered. 20 minutes prior to serving, I add the zucchini, peas, washed chickpeas and spinach. Season with salt and pepper to taste. In a separate pot, follow the manufacturer’s instructions for cooking the pasta. Drain and add to the bowl. 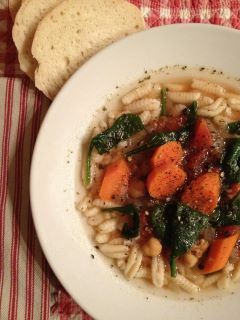 Pour the minestrone over top & enjoy! My daughter had a herbst appliance put in her mouth today by our orthodontist & knowing how painful this must be, I decided to make her a liquid after-school snack to help. 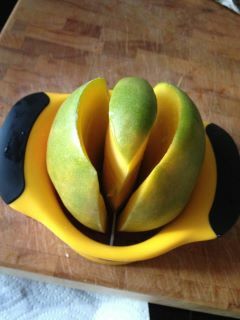 I took my mango pitter – the best tool for removing a mango pit by far – & peeled the remaining flesh. Toss that in your blender with 4 scoops of low or non-fat vanilla ice cream or frozen yogurt, 1 ripe banana & 3/4 c of low fat milk or almond milk. I also throw in some flaxseed meal (2 tbl). Blend that in your blender (mine has a smoothie setting). And pour into glasses with a straw. This makes two large servings. This is my go-to snack! I tend to eat them more at night & after a bit of research, now I’m glad I do. I’ve always known that they are great for muscle inflammation, which I have training for a marathon, but check out all of these amazing OTHER benefits. 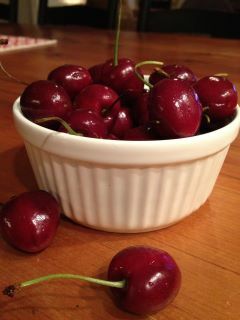 ~It is nature’s most powerful anti inflammatory! This is due to the anthocyanins that block free radical damage better than many anti-inflammatory drugs. ~It lowers the risk factors of heart disease including inflammation, fat and cholesterol according to a University of Michigan study. ~Cyanidin is a natural organic compound that gives berries it’s bright red color. Cyanidin has been found to greatly reduce oxidative damage to cells, research has suggested that it may also be an important factor in fighting heart disease & cancer. ~Provides a memory boost thanks to the anthocyanin! Anything to help me improve memory is a benefit! ~They have a ton of beta carotene! 19 times more than blueberries or strawberries! ~They contain melatonin, which helps regulate your body’s sleep cycles. So glad I snack on these at night! 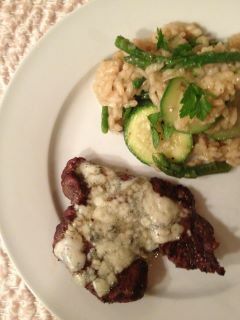 Peppercorn encrusted filet mignon topped with gorgonzola with a side of asparagus zucchini risotto*. 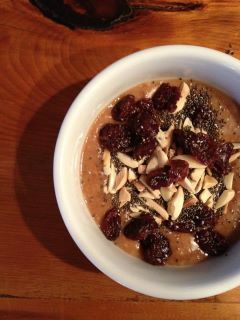 Okay so not every meal I eat has to be over-the-top healthy! 😉 My filet was thinly sliced & oh so good. We had leftover filet mignon from the holidays that we wanted to cook. So we encrusted the filet with peppercorns (on one side) and grilled it over a gas flame. Once it was almost cooked to our preference, we topped it with a tablespoon of gorgonzola crumbles and covered the grill. Once melted, remove promptly, place on a platter & tent with foil for about 5-6 minutes for the juices to return back into the meat. First, bring a pot of salted water to a boil. Place the asparagus in the pot & cover. Cook for 4 minutes. While that’s cooking, get a large bowl of ice water prepared for blanching. Once 4 minutes is up, drain & place the asparagus in the ice bath to stop the cooking process. Remove once the stalks are cold and bright green. Slice in half and keep off to the side. In your large dutch oven, heat the olive oil over medium heat. Add the onion & garlic. Stirring constantly. After 3 minutes, add the rice and constantly stir. This will toast the rice up nicely. After about 4-5 minutes of toasting, add the white wine. Stirring, constantly. This should evaporate in 1-2 minutes. Once that has, add 1.5c of the chicken stock to the rice. Keep stirring until the rice absorbs all of the liquid. This takes a few minutes. Then repeat with another 1.5c of chicken stock. Stir until absorbed. Finally, add the final cup of chicken stock. Stirring for about 2-3 minutes. Then you will add the zucchini disks to cook. At this point I added a splash more of the stock and covered the pot for about 2 minutes. (Add more broth or water if necessary). Uncover an stir again. Then add your asparagus to heat through. Serve immediately. *Can be served alone for a vegetarian dish as well! If you’re captivated by spicy food, as I am, you may want to give this recipe a try. 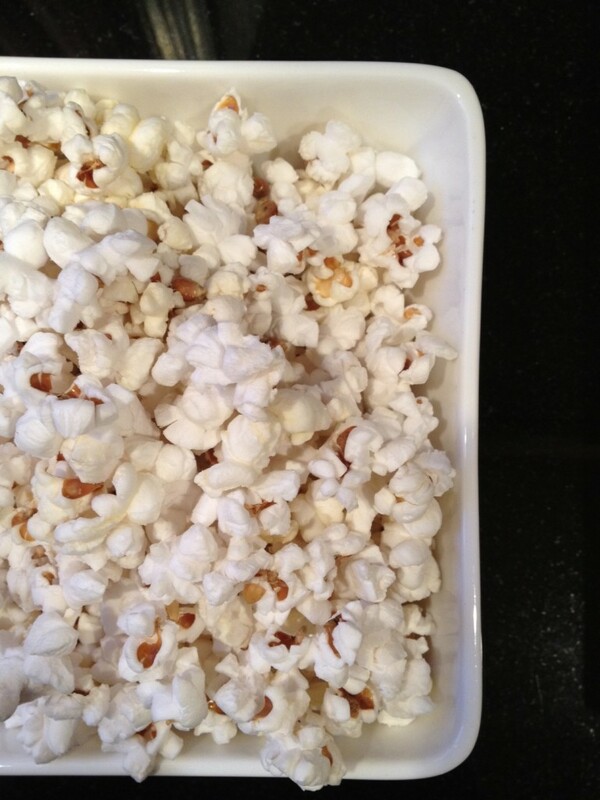 First, homemade popcorn is so much better than microwaveable. 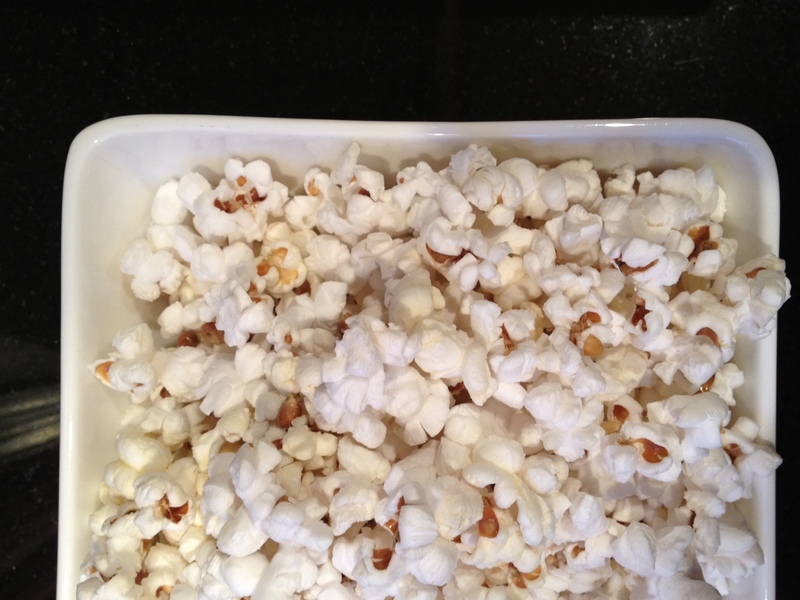 Second, popcorn is a healthy snack because it is a whole grain and has 1g of fiber per cup. 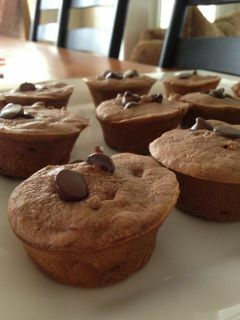 Third, it is much easier than you think to make it and you don’t need special equipment! Drizzle about a 1/4 cup of spicy oil on the bottom of your 3-4 qt. saucepan and place over medium flame. Add approximatley 1/2 cup of your popcorn kernels and cover with lid. Shake occasionally. Once the kernels stop popping, remove from the heat. We sprinkle a tiny bit of salt over it and serve right away. The spicy oil gives it a nice kick & no need for butter.